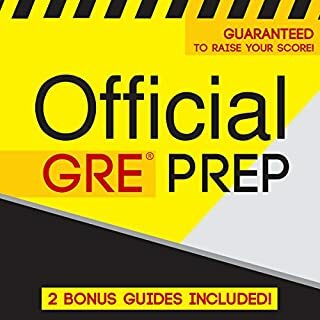 Official GRE Prep has everything you need to prepare and excel on the GRE! 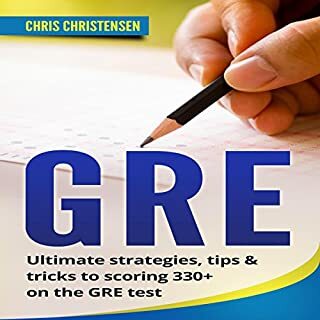 There are few tests as important as the GRE. It controls your admission to top graduate schools and arguably predicts your success in graduate programs. 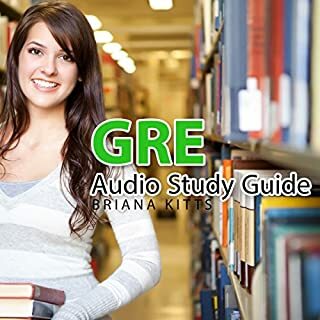 Now you can vault to the top of the class with this massive new GRE audio course. This is the second in this series of Core Words. After learning the first 100, this audiobook has the core 500 words used in the SATs and GREs over the last 50 years. 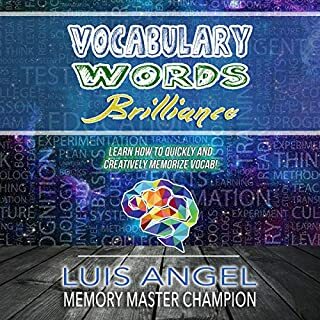 This audio book is best used after the Core 100 words are mastered so as not to intimidate the student. First things first: congratulations! Taking the GRE means that you're seriously thinking about a graduate degree. That takes some serious dedication, my friend. Now the bad news: this test - the only thing holding you back from that advanced degree in German, International Policy, or Genomics and Genetics - is going to make you think about (and use!) a whole bunch of stuff you haven't given any serious consideration since high school. But don't panic! Guaranteed to give the student a solid core list of words for the SATs. Unlike most SAT prep courses, this short concise audiobook is laser focused on the words themselves. It does not wear down and intimidate the student with length and breadth. The words you use say a lot about who you are and where you're headed. Whether you want to express yourself clearly to impress a prospective employer during a job interview, or just brush up on those pesky words you encounter every so often reading the newspaper, Kaplan Word Power is the essential tool to help you expand your daily vocabulary. Download AudioLearn and study at the gym or in the car. With its convenient format, AudioLearn fits your busy lifestyle, enabling you to study anywhere – anytime. Best of all, you'll significantly increase learning and retention with our proven formet. 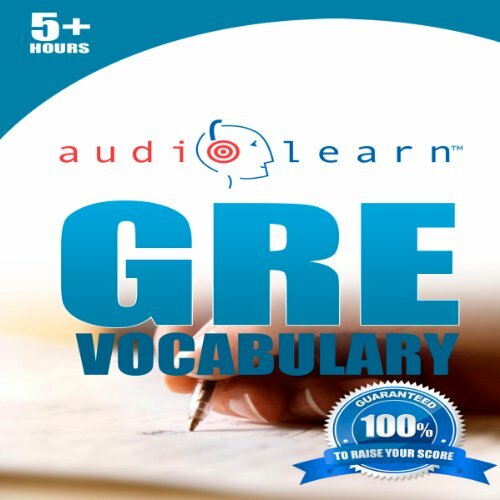 What did you like best about GRE Vocabulary AudioLearn: AudioLearn Test Prep Series? What did you like least? This isn't a novel. No characters, just the narrator. yes. the narrator has a pleasant voice. 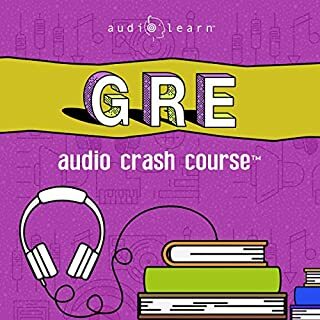 Did GRE Vocabulary AudioLearn: AudioLearn Test Prep Series inspire you to do anything? It will really help if this audio book comes with a PDF of words because some words are spelt incorrectly and some definitions aren't correct due to rough editing. e.g. extemporize was defined incorrectly, the book reads - 'to speak with preparation' whereas the true correct definition is 'to speak without preparation'. There are more misspelt words, but I won't list them all. I have to say that this book was useful in my study fro the GRE. I must have listened to it 15 times (at 3x speed, which is pretty easy to do since normal speed is pretty slow). 2 - Sloppy Production - at least one word and possible more were repeated, i presume this was due to sloppy editing. Also, there were some spelling sections that I believe were skipping some letters (again some kind of recording/editing issue?). I could probably go on a bit longer. However the bottom line is that I thought this was a valuable book. It did help me with studying. I just wish they could take a little more pride in their product and look more and some of the details. I was disappointed with this program. I did like the format, which gives the spelling of the word, part of speech, and definition and then uses the word in a sentence; however, multiple words are mispronounced, at least one definition is wrong (so far), and some example sentence contradict the meaning. Additionally, some of the sentences demonstrate that the authors of the program do not understand the nuances of the words. Also, although the subject matter is dull (and the example sentences sometimes duller than the definitions), the reader delivers the material in such a flat, toneless way as to put the listener to sleep - when he or she is not shouting the correct pronounciation, that is. I would have gone over the material and made sure that I could pronounce the words - at the very least. A for the idea and the structure, D+ for execution. What made the experience of listening to GRE Vocabulary AudioLearn: AudioLearn Test Prep Series the most enjoyable? the structure is good for vocaubulary learning. Have you listened to any of AudioLearn Voice Over Team’s other performances before? How does this one compare? 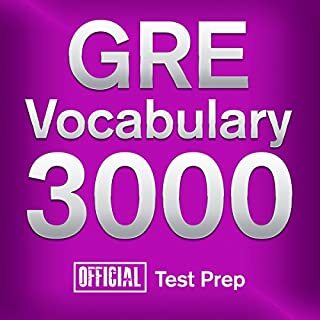 What insight do you think you’ll apply from GRE Vocabulary AudioLearn: AudioLearn Test Prep Series? it's good for English learning, but it will be better if there is PDF accompanied. Would you try another book from AudioLearn English Team and/or AudioLearn Voice Over Team? Terrible. Why didn't they hire someone who knows how to pronounce these words? I mean, "adjetive" for adjective? "Hunerd" for "hundred?" And these aren't even the GRE words. If you could sum up GRE Vocabulary AudioLearn: AudioLearn Test Prep Series in three words, what would they be? The speaker is very calming and speaks in a monotone type of voice. If you are lying down it is easy to go to sleep. The list is very convenient because it says the word, spells the word, defines it and then uses the word in a sentence. I found it helpful to break the book into 50 word sections and write the words down as they were spelled out. I haven't taken the GRE yet, but I found that a lot of words here are pretty useful for everyday life. very helpful study tool for vocab words, especially if you have limited time. There were a few words that didn't have a sentence with the description, but overall this audiobook was pretty thorough. The audio quality of this book is bad at best. One can hear the start and stop of the recording during production. Although the content is useful the "punch in" and "punch out" of the recording makes listening at high volume aggravating. The vernacular of the book is not very comprehensive. For one that is not well read; this audiobook is helpful. While the dictionary is useful, the recording quality is so poor that at times you cannot decipher what the narrator is saying. The audio has a constant buzz accompanied by random loud clicks, often during the pronunciation of a word. Additionally, the narrator mispronounces about 25-30% of the words! She pauses at inappropriate times, and then heavily sighs back into the microphone as she begins speaking again. Despite her spelling each word, an accompanying pdf would greatly help in learning these ~700 words, especially because the tone of the entire program is so soporific that it's hard to stay tuned in. Lastly, more than a few times, the numbering skips around. For example, "Number 257a: (word); Number 301: (word)" or repeats words altogether! I'm guessing this is also due to poor editing. Overall, this audiobook has left me more annoyed than educated. I had to purchase another study guide from a different publisher to supplement this one. Oddly enough, that one did not come with a pdf either, although the narrators repeatedly say, "Be sure to check the included pdf for spellings."